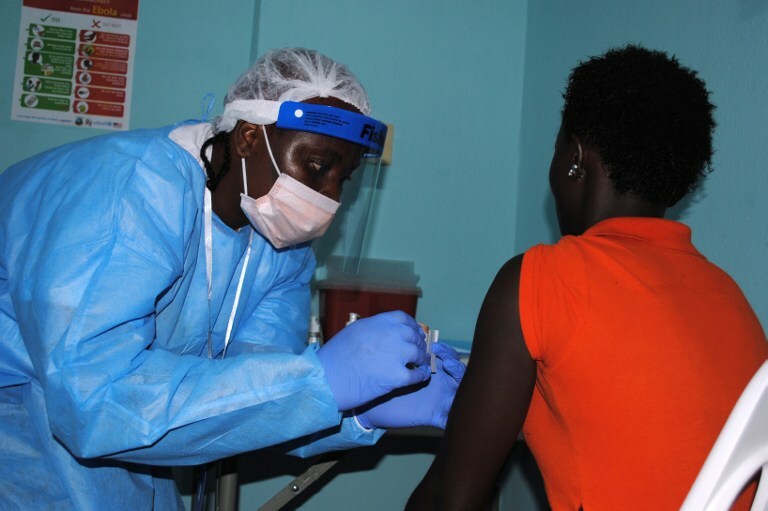 MONROVIA, Liberia – The first large-scale trials of two Ebola vaccines began in Liberia on Monday, February 2, the hospital hosting the research said. The vaccines, which contain harmless elements of the killer virus that trigger an immune response, were administered to 12 volunteers at the start of a trial which will eventually involve up to 27,000 adults. "We received 20 persons who came voluntarily to take the vaccine but we are taking only 12 per day," said Melvin Johnson, head of the trial center at the Redemption Hospital in the capital Monrovia. "The first 12 were given the vaccine and the balance will receive theirs on Tuesday (February 3)." The Partnership for Research on Ebola Vaccines in Liberia (PREVAIL), a collaboration between the United States and Liberia, said trials would begin at other hospitals around Monrovia after the first 600 participants join the study. The candidate vaccines – GlaxoSmithKline's Chad3-EBO-Z and rVSV-ZEBOV, manufactured by Merck and Newlink – have been determined as safe for use on humans in smaller trials in several countries. PREVAIL said the drugs could cause pain, redness or swelling in the injected arm, as well as fever, headaches and tiredness, but added that the side-effects "typically have been mild to moderate and have gone away on their own". The study, led by the US National Institutes of Health, was launched at the Redemption Hospital on Sunday at an event attended by Liberian Vice-President Joseph Boaikai. "We hope that this scientific undertaking we launch here today will get answers for the mystery surrounding this disease," he said. There is currently no vaccine to guard against Ebola on the world market, and no specific drug approved to treat it, even though the virus first emerged in the 1970s. Researchers have said that it remains unknown what level of immune response is needed to protect humans from Ebola, which causes often fatal hemorrhaging, organ failure and severe diarrhoea. Liberia, Sierra Leone and Guinea have registered almost 9,000 deaths since the beginning of the worst outbreak on record in December 2013, although experts believe the real toll could be significantly higher. The World Health Organization (WHO) said last week however that the countries reported fewer than 100 new lab-confirmed cases in the past week for the first time since last June. "It's fantastic that large-scale trials of the first candidate Ebola vaccine are getting underway in Liberia, a country that has suffered enormously at the hands of this disease," said Jeremy Farrar, director of the Wellcome Trust. "The WHO confirmed last week that infection rates there continue to fall, which emphasizes the need to complete these crucial trials as quickly as possible," Farrar said. "The international response that has got us this point has been phenomenal and we must keep on course until the infection rate is brought down to, and remains at, zero."